Family engagement matters in children’s learning. “It has the biggest impact on those most at risk,” says Margaret Caspe, director of research and professional learning at the Global Family Research Project. So how do libraries put pressure on local, state, and federal policymakers and agencies to connect parents, caregivers, and educators to more family engagement opportunities? That was the question at the center of “Improving Federal and State Policy to Support Family Engagement in Libraries,” a Saturday morning panel sponsored by the Public Library Association (PLA) at ALA’s 2017 Midwinter Meeting & Exhibits in Atlanta. Caspe reinforced that family engagement is a shared responsibility, can happen anywhere, and can happen at any stage in a child’s life. She also highlighted different agencies and laws that allot for family engagement initiatives (Every Student Succeeds Act [ESSA], 21st Century Community Learning Centers, Head Start Act, Individuals with Disabilities and Education Act [IDEA], Department of Justice, Department of Health and Human Services) and how Title I funds from ESSA is one of the largest funding streams for family engagement programs. “Unfortunately, we see disjointed efforts on the ground,” Caspe says, due to fragmentation and silos, limited investment in monitoring and capacity building, and a lack of training prioritization. She notes that states have begun taking the lead on initiatives and stressed the importance of developing new partnerships. Larra Clark, deputy director of PLA and ALA’s Office for Information Technology Policy, spoke of the advocacy work ALA and the Institute of Museum and Library Services are doing on the federal level, including securing library funding, filing comments with federal agencies (including the Department of Education and Domestic Policy Council), and fostering collaborations with other organizations. Johanna Pringle, Title V senior manager at the Georgia Department of Public Health, gave a state perspective by sharing her agency’s Maternal & Child Health Services program. “We identified four levels [of family engagement] in our state,” she says, which range from people providing basic input, such as surveys, to the full integration of families into the program. “We’re starting to identify our common agenda, and our families are helping us figure that out,” says Pringle. She also noted how her agency is trying to redefine which populations they’re reaching, making a bigger push to engage dads and teens. 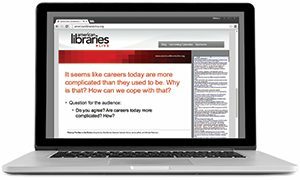 Overall, how does a library or librarian influence policy? Scott Allen, deputy director of PLA, suggested starting small, taking basic actions, and sharing community successes. He also encouraged libraries to join local networks and identify and educate IDEA Part C Early Intervention service providers on library programs. “Sometimes it can be as simple as creating a new form or process and elevating that up,” says Allen. 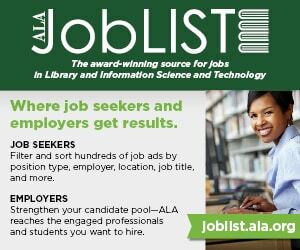 TERRA DANKOWSKI is associate editor for American Libraries.